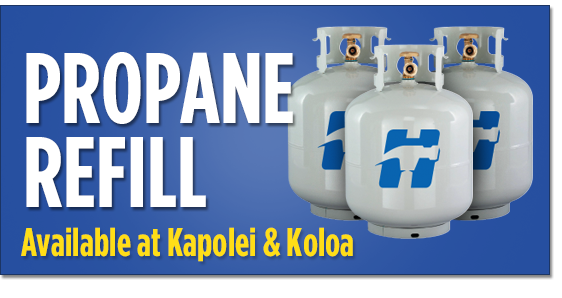 Propane Refills are now available at our Kapolei store on Oahu and our Koloa store on Kauai. Our Kapolei Store is conveniently located at the Waianae end of Kapolei just past the Costco Gas Station. Perfect for Propane Refills if you are in Kapolei, Ewa, Ewa Beach, Makakilo, Waianae, Waipahu, Mililani, or Kunia. Just drive to Hardware Hawaii Kapolei with your tank and see a cashier in the store. And if you need a new propane tank, we have those too. Visit our Kapolei location for all of your hardware, lumber and PROPANE needs! Our Koloa store offers both refill and exchange programs. So if you have your own tank, feel free to bring it in. If you do not have your own propane tank we can get you started with our Propane Exchange Program. It’s easy. When ever your tank runs out, bring it back, and we give you a full one. Easy!